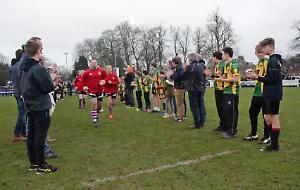 HENLEY HAWKS produced arguably their best performance of the season as they beat a tough uncompromising Taunton side in a thrilling encounter at the Commplus Stadium in Taunton last Saturday. Before this game Taunton were lying in second place and were touted by many as possible promotion candidates. As a result Henley move up to fourth in the league and look to build more momentum in the coming weeks. With a strong wind blowing across the pitch handling and kicking were going to be tough but the Hawks produced two pieces of fine handling to score two good tries. As Storm Callum blew the Hawks produced a workmanlike performance. The score line was tight throughout the game but Henley produced the better chances and would have sealed the victory if Ryan O’Neill had been able to hold on to a difficult bouncing ball with the try line at his mercy. In the end the centre, playing his debut game, had a good all-round performance. The first score came after some seven minutes when turnover ball was worked right and some deft hands from Marcus Lowe and good footwork by George Wood saw Xavier Andre score under the posts with Roddy Giles adding the extras. This was just the start the visitors wanted playing slightly into the strong wind. Another half chance went begging as a long pass was nearly intercepted by the Taunton winger only to drop the ball — had it gone to hand George Wood may well have gone over in the corner. In the end the only reply was a Taunton penalty kicked by Gary Kingdom in front of the posts. With half-time approaching Henley were again under pressure but a turnover at the line-out meant the Hawks were able to go in 7-3 to the good. Taunton took the lead for a brief moment in the second half as their centre was able to crash over after some sustained pressure on the Henley line. This was short lived as the Hawks built pressure once again for the ball to be moved wide to Lowe who strode in from 20 metres. Giles added the extras. The game was at this stage finely poised and Taunton were once more pressurising the Henley line but good defence kept them out time and time again. However, the inevitable eventually happened and numbers told as a strong surge by the home side flanker enabled him to touch down midway out. The conversion was missed and Henley now went into the final 10 minutes one point ahead. Henley managed to put pressure on the Titans line and cleverly ran the clock down and Giles even managed to kick a penalty with the final play of the match. Henley Hawks: Robinson, Wood, O’Neill, Andre, Portland, Giles, Webb, Cook, Emery, Manning, Hyde, Albon, Lunnon, Lowe, Bradley. Replacements: Primett, Stobbs, Neal, Hall, MacDougall.